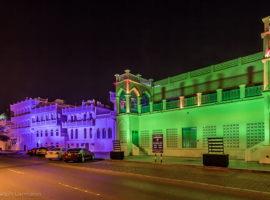 In the role of general contractor, AO Lighting and its creative division AO Creative illuminated the capital of Oman, Muscat, along with many of its most notable sights as part of the Muscat Festival of Lights. 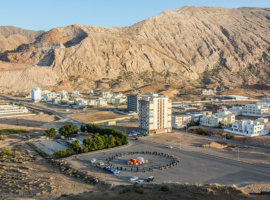 Bathing in changing colors not only the coastal road but also such landmarks as the Riyam Monument, the Mutrah Fort and the Mutrah Gate. 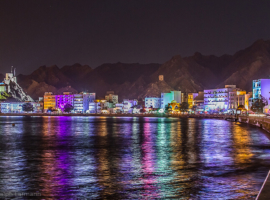 A city gleaming with ever changing colors – like a chameleon. 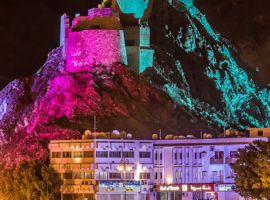 Its reflection spills into the Gulf of Oman, involving it, too, in the enchantment… The pièce de résistance of the magical illumination was the Mutrah Fort, which is perched on a rock dominating the city. 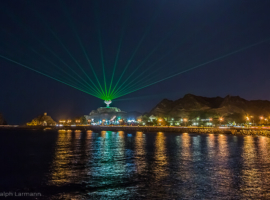 The Muscat Festival of Lights was a triumphant success and the client delighted with the decision to rely on the expertise of our full service provider, AO Lighting. 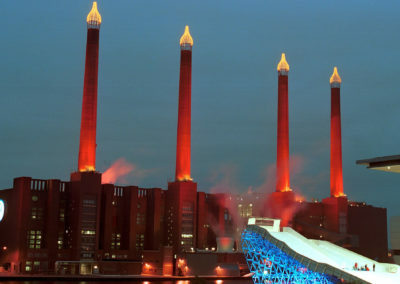 The creative division AO Creative conjured new life from many of the city’s most venerable landmarks using a mesmerizing play of colors. 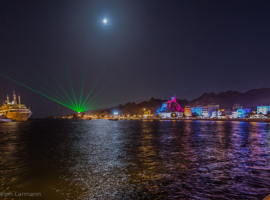 The Mutrah Gate, with its illuminated brilliance, pointed the way to the port of Mutrah, one of the oldest in all Oman. 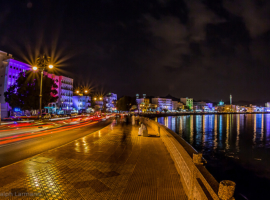 The 1.7 kilometer-long corniche, with its merchants’ houses and the buildings of the Old Souk, became a vivid kaleidoscope – with a new constellation of colors revealed each instant. The dramatic backdrop was formed by the spectral forms of the Hadschar Mountains, the foothills of which extend to the sea shore. 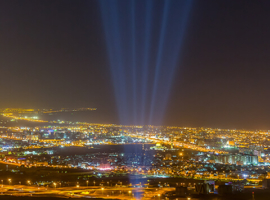 And in the eastern extremes of the city, the Riyam Monument appeared, a huge incense burner, radiant, and mystical, ringed by restless lasers. Whoever chanced into the coastal city of an evening during the festival found themselves in a magical setting they will not quickly forget. The highlight of the Muscat Festival of Lights was the twister in the Bawshar sand dunes, a little further to the west. Visible throughout the valley and far beyond, it announced to all who would listen that it was festival time once more. 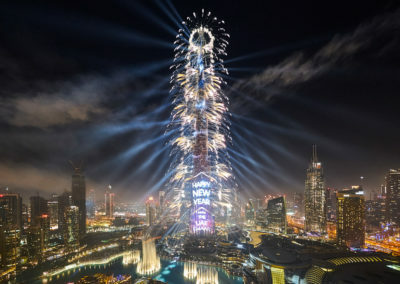 It was the first time such a pillar of light had ever been erected anywhere in the Middle East, and its choreography, emulating the traditional patterns of Mashrabiya, inspired massive enthusiasm: a sunshade made out of sunlight in the nocturnal darkness. 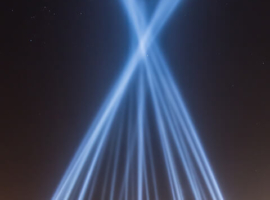 The twister was implemented using FALCON BEAM colour 7000W and FALCON 6000 CMY xenon searchlights. 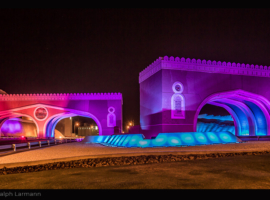 The lighting design for the Muscat Festival of Lights was the work of AO Creative under the direction of Jerry P. Appelt. 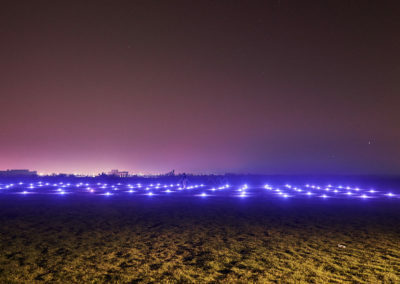 AO Creative completed the planning and programming for the festival, and the colourful illumination of the various locations, in close collaboration with the client. 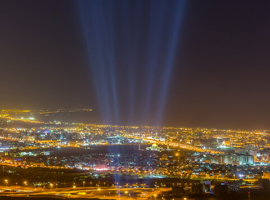 In all, some 300 luminaires were deployed, including brilliant high-powered searchlights and a variety of LED floods that presented each of the numerous locations in ever changing colours, showing each one constantly in a new light. Muscat was transfigured – and all could revel in her apotheosis.